Easy Sunday dinner. There is nothing better than a slow cooked meal of Salisbury steak and gravy served over mashed potatoes! Easiest recipe ever! 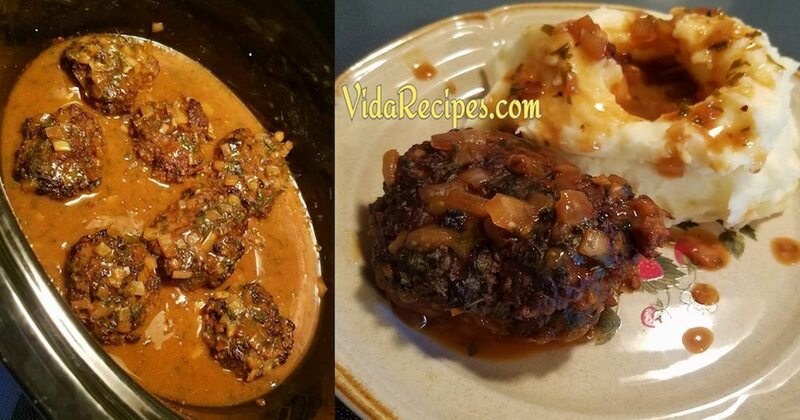 This is one of my favorite recipes of all time and the gravy is delicious! A perfect Sunday meal for the family that they’ll love! Turns out perfect every time. Slice mushrooms and onions in slow cooker. Combine al of the beef patty ingredients and form into 4 patties. Brown over medium high heat (about 3 minutes per side). Place beef patties into slow cooker on top of mushrooms. Combine remaining ingredients except water and cornstarch. Pour over beef and cook on low 5 hours. Once cooked, remove patties from slow cooker and set aside. Turn slow cooker onto high. Combine cold water and cornstarch then stir into the broth and let cook a few minutes until thickened. Add beef back into the sauce to coat.